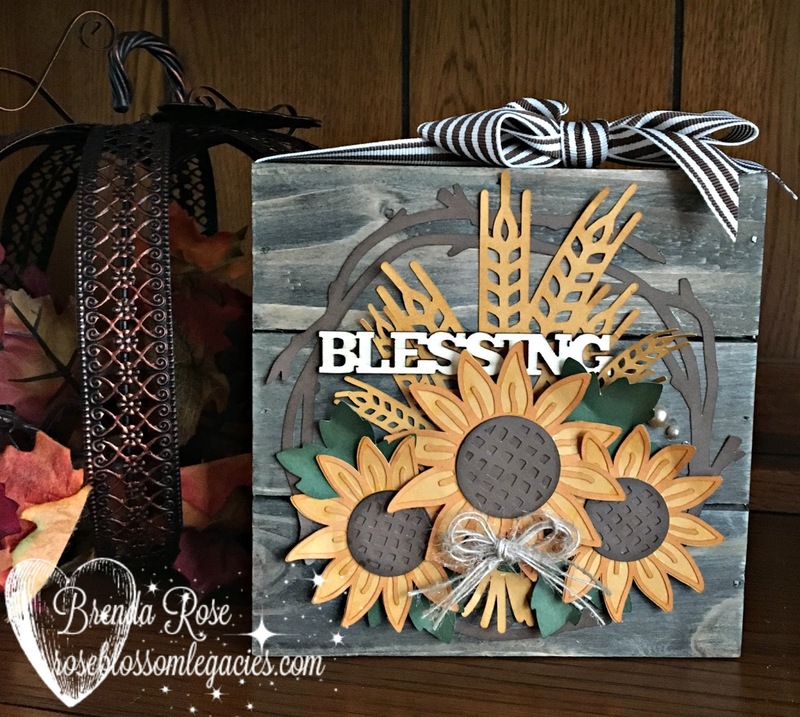 Welcome to the Rose Blossom Blog Hop! We are so glad that you joined us for this special hop! Tonight we are bringing artwork from the Flower Market Cricut Collection to you. As always, this hop is a great big circle. If you started elsewhere, that means you are joining me from Sue's blog. You'll just keep following the big circle until you are back to where you started. There is so much more to this Cricut collection than just flowers! There are leaves, branches, vases, and themes to cover every season of the year. Not to mention, there is an excellent font! I am quickly finding this cartridge a go-to for pages, cards, and home decor. I really like fall home decor. The colors are so soothing, and it's such a joy to have these things around the house. So I grabbed a 6" wood pallet and went to work creating! Aren't these cuts fun when put on wood? "Blessing" is a wood element I had in my stash, and the twine is from the Rustic Home Ribbon Pack. I used Liquid Glass to adhere the pieces to wood, and 3-D and Thin Foam Tape to attach the sunflowers. If you separate the twine in the Rustic Home ribbon pack, you can get a nice messy bow! Now it's time to move on to Lynn's lovely blog! I know you will find great inspiration there!! 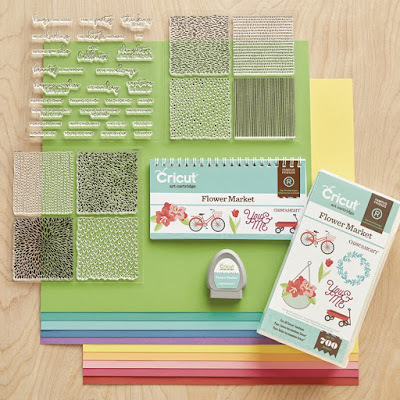 To order your Flower Market Cricut Collection, click HERE! Brenda, this project is just fantastic! Love, love, love it! I love this idea! 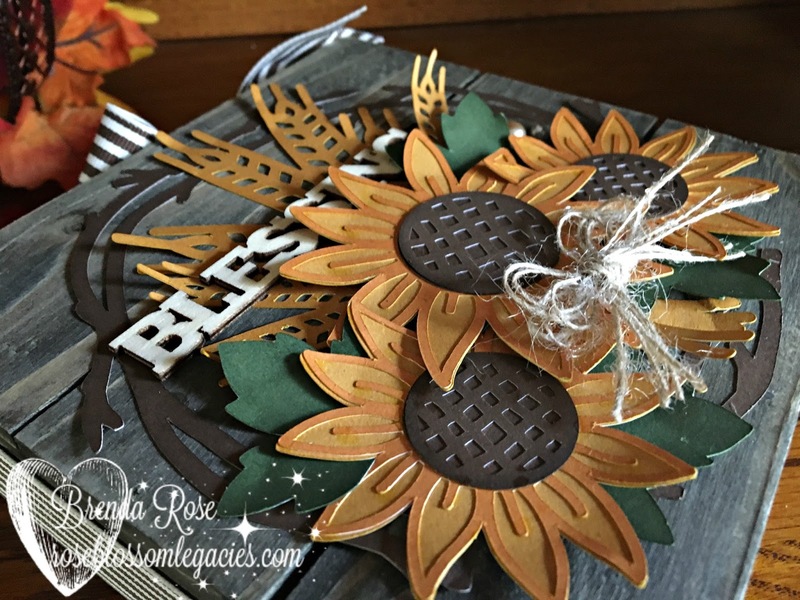 That wood pallet looks really lovely with those gorgeous fall flowers. I've been wanting to do some 3-D projects, and this is such great inspiration! Great decoration for fall or really anytime! The wheat tucked in behind the sunflowers is so perfect.This piece is a good study in clustering and I'll be examining this over and over! Thanks for sharing the cut file ... very nice of you. Gorgeous as always! Brenda, you never cease to amaze! Those sunflowers are beautiful! I just want to reach out and touch them!! What a truly special home decor piece! Brenda, this piece is absolutely gorgeous! I love all the layers and your inking. So beautiful! Oh my goodness...this is just beautiful Brenda. Love the pallet idea and the sunflowers and wheat stalks tucked behind are so perfect. You have such a creative touch...love your artwork!